An advanced, wax enriched and non-drip formulation, that colours and weatherproofs rough sawn timbers, such as sheds, fences, trellis-work and pergolas for up to 5 years. Quick drying, low odour and safe to use around plants and pets. 5L covers up to 24m2 with a single coat. 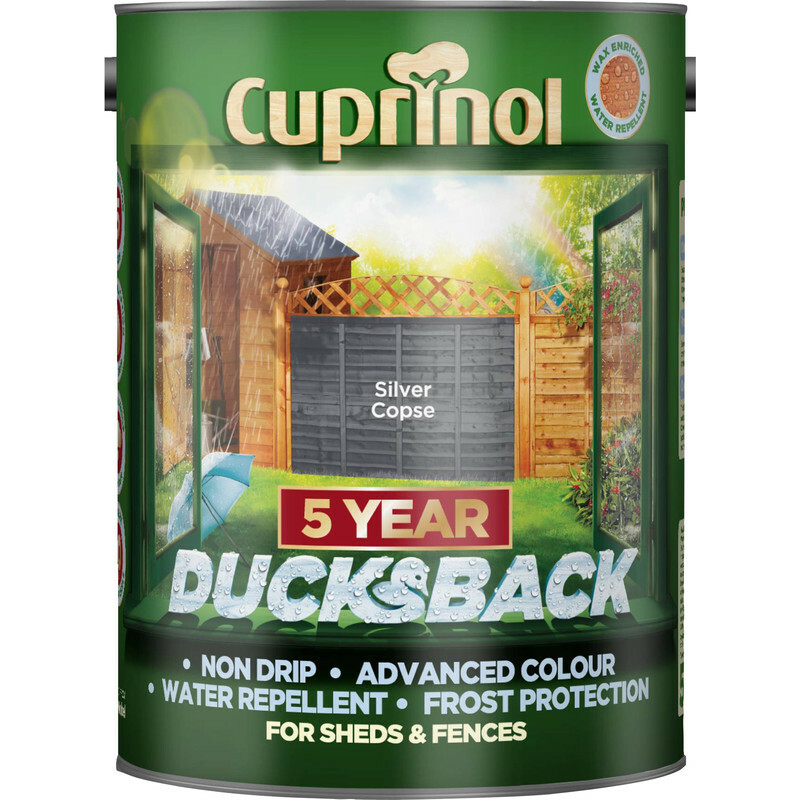 Cuprinol Ducksback Shed & Fence Treatment 5L Silver Copse is rated 4.7 out of 5 by 25. Rated 5 out of 5 by Brussels from Green paint I bought this product to paint a recently build wooden fence and as the paint is a green, the fence is now after two coats green in colour. Great, just what I expected. Rated 5 out of 5 by PJER from Good coverage This should have been forest green,my mistake. So the branch were very helpful and changed it for me. This product is very good (as I already knew from having previously used it). Totally better than other fence paints on the market. Rated 5 out of 5 by davep51 from great colour great coverage! totally value for money great colour great coverage goes on like paint not coloured water! Rated 4 out of 5 by Stephen13 from Goes on well Bought this to do a fence easy to put on doesn't splash everywhere & nice colour. The amount of panels it says it does is 10 however I only managed 6 & that was just 1 side!